Festivals are a long established part of our British culture. In the UK, staple summer events like Download (which itself grew out of the legendary eighties Monsters of Rock festivals) are however in severe danger of being overtaken and even replaced. There is always the opportunity for entrepreneurial individuals to come aboard with a fresh and different approach. Sometimes the established events grow complacent and stale, and they leave themselves open to competition from newer brands. Run differently, and with smaller audiences, they can often offer a more personalised experience than that which the faceless larger festivals can offer. Ramblin Man Fair in Kent is a relative newcomer to the summer calendar. Starting just last year, it was an instant success. Based on this year’s event it looks set to rapidly establish itself as a candidate for the UK’s premier music festival. Situated in a town centre park on the first day we had the unusual experience of arriving rock, prog, country, and blues music fans mixing freely with the regular dog walkers and family picnickers. What Ramblin Man does differently is that rather than just focus on a single musical genre it offers diversity and variation across several musical styles with a range of specific musical stages. This allows a generally more mature age bracket of fan with a broader musical taste to move between stages and musical styles. Portrayed as a “family” festival, it allows parents to bring their younger generation along to witness some established and new artists. Being outdoors also ensured noise levels could be carefully monitored to protect the younger ear drums. Location wise all stages were in a close distance of each other, so no excessive and long trips between stages. General facilities – i.e., basic amenities like food, drink, and toilets – were of a very high standard. Queues were, of course, to be expected – that’s the norm at these things. But efficient operation of those outlets helped to successfully minimise any waiting times. Weather is always a factor which will make or break an event, and with the British summer usually meaning the same atmospheric conditions as every other season, it holds the key to enjoyment levels. Earlier this summer I experienced the full English range of weather over the period of a couple of hours on the first day of Download Festival. Both blazing sunshine and thunderous rain. However, this year’s Ramblin Man was truly and divinely blessed with hot summer sunshine (remember that?) over the course of most of the weekend. That made for a general more positive vibe and level of friendliness over the duration of the Fair. Being an old-school rock fan, I focused my attention primarily on the main stage over the two days’ duration. However, I also took time to check out all the other stages over the weekend. To check out new bands, meet the different fans of specific musical genres, do interviews, and also generally soak up the Ramblin feel-good factor which was emanating all around the site. 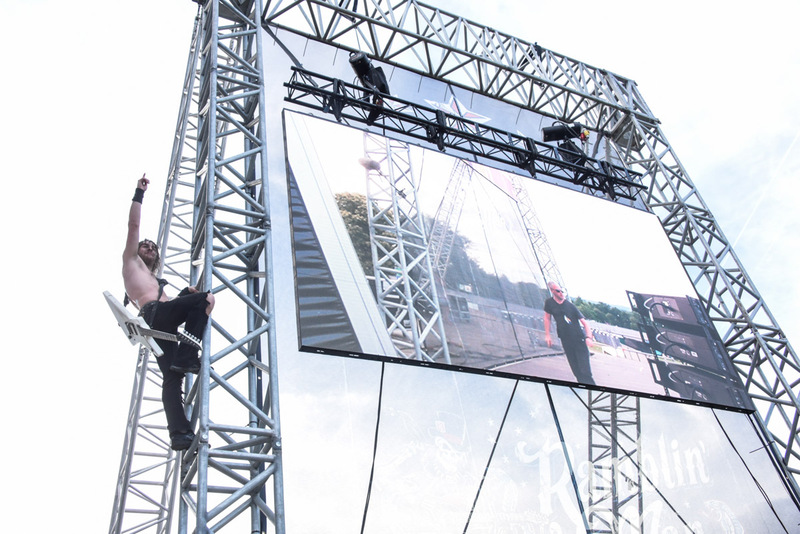 Kicking off proceedings on Day One were Inglorious – hewn of a classic rock identity and led by powerhouse vocalist Nathan James, this band are definitely future stars in the making. Though after having seen them several times in recent months I would prefer them to drop the cover versions from their sets. Following them on the main stage were another band that also foolishly inserted cover songs into their festival show. The pedigree of the individual band members is unquestionable, but what the Dead Daisies do best is to enthusiastically play their own material and execute it in a solid manner. I didn’t really get into Terrorvision the first time around when they were making commercial inroads into the British charts. 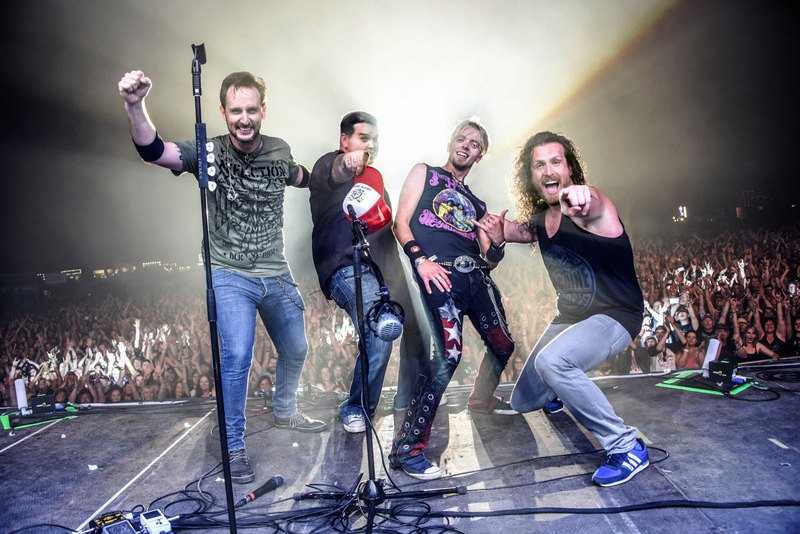 They did however deliver a solid set of many of those “hit” singles and appeared to have enjoyed playing them again, and a lot of fans dug their pop rock melodies which served as an appetiser ahead of their forthcoming UK tour. If anything, Ginger Wildheart, with his extensive back catalogue, almost sets out to disappoint. You know that no matter what songs he plays then he will leave others out which will leave people let down. Such as it was with his delivered festival set, as he chose to largely ignore the Wildhearts’ successful back catalogue which made his name. Generating a mixed response from an artist that could have really seized the day and grabbed the crowd from the outset. Europe are a much maligned act that are still tarred with the label of that song. After having seen them on their recent War of Kings album promotional tour I very quickly reversed that personal opinion. Mixing a set of songs from that album with their long-standing established hits they won over many of the audience who had similarly remembered them as one pop/rock hit wonders. Europe are a really quality hard rock and blues-based live act consisting still of the same band members. Definitely a festival highlight for me personally. Thin Lizzy are a legendary act that are still around, their set with special guest Midge Ure (die hards know his long-standing link to the band) delivered all the standards and also a few revisited classics such as “Angel of Death” with full stage effects – smoke, explosions, etc. Those few detractors were blown swiftly and smartly away by a great hard rock band that were on fire. Joined by not one but two special guests – Scott Travis (Judas Priest Drummer), and Tom Hamilton (Bass of Aerosmith) – was great visually. In the end, however, the songs did their job effectively, as Ricky Warwick had the audience eating out of his hand. Unfortunately, Thin Lizzy clashed with legendary band Uriah Heep on the Prog stage. As I had never previously seen them live I had to avail of the opportunity to check out the second part of their set which far exceeded all my personal expectations, as they delivered a high quality performance which including some classics such as “July Morning.” Another bucket list band firmly ticked off. 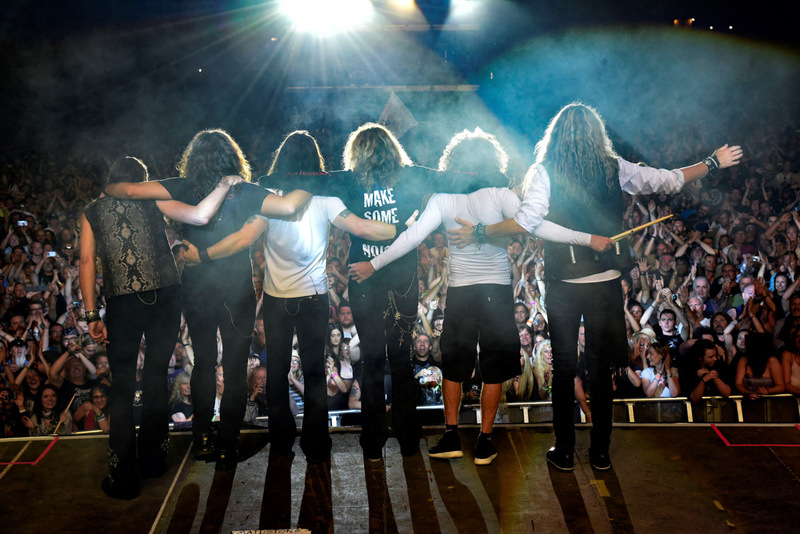 My favourite band ever since I first saw them back in 1984, Whitesnake were the main stage headliners on day 1. On (if some rumours were to be believed) their final tour – The Greatest Hits set left me whetting my lips in anticipation. Hits were delivered but unfortunately two guitar solos, a bass solo plus a drum solo ruined the flow of the set and left attention spans waning. In conclusion, perhaps omitting solos and doing a few more songs may have been a better course of action to follow as festival headliners. Day one competed and anticipation levels were high for day 2. Day 2 featured many highlights over several stages from the sublime blues guitar playing of Pat McManus opening the Blues Stage at lunchtime. Main stage attractions included another bunch of Northern Ireland musicians, The Answer, still celebrating their debut album Rises tenth anniversary. The Answer and the Aussie beer-rockers Airbourne both delivered crowd pleasing sets which demanded audience participation and involved the audience actively playing a part. Southern country elements were given an airing with the Cadillac Three and the Kentucky Headhunters. I can’t fully fathom the sudden upsurge in the popularity in this musical genre but it certainly seems to have taken off rapidly in recent years. Thunder are a band that I have seen regularly since the eighties and never ever have they failed to entertain. Danny Bowes continues to possess one of the finest voices in a British singer I have heard. Familiar classics never grow old, and songs from the latest album Wonder Days slotted comfortably alongside those. 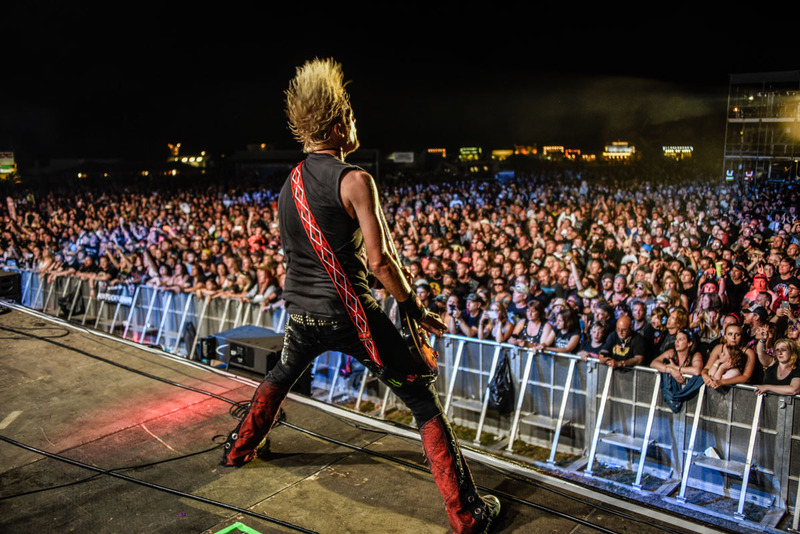 Bringing things to a close were Black Stone Cherry who regularly reminded the audience that it was a historic first for the band to headline their first festival. Mid-set tech issues, oddly during the acoustic session, were dealt with professionally and they conquered a huge crowd with their Southern fried rock. I also took in legendary space rockers Hawkwind – as bat crazy as I expected in addition to witnessing some upcoming sterling performances from the soon to be Massive Wagons and Dirty Thrills. No negative aspects to the festival and I’m sure like many I will be embarking on the long trek to Maidstone rock city again next summer! Counting down the days.